If your tastes are more traditional but you want a wedding ring that sparks interest, we have the perfect solution. Our satin-finished titanium wedding band with diagonal grooves is one of the most visually interesting pieces of jewelry in our inventory. A slight dome accentuates the swirling pattern of diagonal grooves, which are contrasted by a polished interior that gleams brilliantly in any light. A satin finish is soft to the touch, much like a polished ring, but without the sheen of a high polish. Alternative metals are quickly surpassing precious metals, and titanium is leading the way. Titanium offers a superior resistance to corrosion, denting, and discoloration, but it is also lightweight and comfortable to wear. Celebrate the best day of your life with a ring that speaks volumes about your unending commitment. 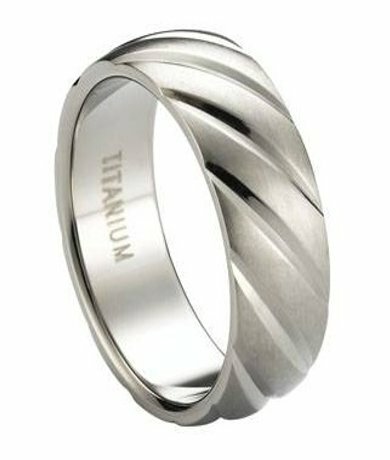 Each satin-finished titanium wedding band with diagonal grooves features a traditional design. Traditional rings fit differently than comfort-fit rings or heavy domed rings. We recommend that you visit a professional jeweler to have your finger sized for accuracy and comfort. Once you decide that a traditional ring is right for you and your lifestyle, look no further than the 8mm men’s satin-finished titanium wedding band with diagonal grooves for a lifetime of love and happiness. JustMensRings.com takes great pride in our ability to offer a wide selection of wedding rings. If you have any questions about this item or need help with your order, please contact us today for further assistance. Let us know how we can help to ensure your wedding day goes off without a hitch. Purchased this item as a replacement wedding band for my husband. Ring received quicker than expected and was better in person than on the screen. My husband could not be happier and is none the wiser at how inexpensive it was. Looks great! Very nice ring, shinny and looks great. Perfect, exactly what I ordered.